William Goldman is one of the best screenwriters Hollywood has seen. He is the author of “Butch Cassidy and the Sundance Kid” (an original script that won him his first Oscar), “All The President’s Men” (maybe the most difficult adaptation ever made in Hollywood, it won him Oscar number two), “Marathon Man” (excellent script on his own book) and “The Princess Bride” (same again). Whenever he retires, he’ll have earned his pension alright. 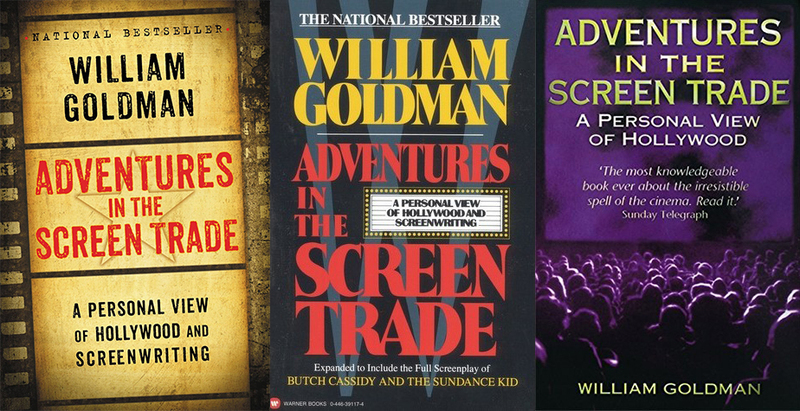 Adventures in the Screen Trade is the first book I ever read on screenwriting. It was in 1989. It created an everlasting impression on me. Because it is enlightening, worthy and fun. And it stays that way. Goldman defines it as “a book about Hollywood”, but is, in equal terms, a book about writing: “A Personal View of Hollywood and Screenwriting”. “Nobody knows anything…… Not one person in the entire motion picture field knows for a certainty what’s going to work. Every time out it’s a guess and, if you’re lucky, an educated one.” In case you didn’t know, NOBODY KNOWS ANYTHING is one of the now Famous Two Mantras of this book. My favourite two sections of this first half of the book are: The author’s account on meeting Steve McQueen about a Western film Goldman wrote (it’s just one page long, but it weights pounds) and his chronicle on how The Verdict actually happened (an eye-opener about Stars and Hollywood at large). “Writing is finally about one thing: going into a room alone and doing it. Putting words on paper that have never been there in quite that way before. And although you are physically by yourself, the haunting Demon never leaves you, that Demon being the knowledge of your own terrible limitations, your hopeless inadequacy, the impossibility of ever getting it right. No matter how diamond-bright your ideas are dancing in your brain, on paper they are earthbound.”. “The more information an audience has, the less additional information it requires. And the ladling out of when and where something is necessary is one of the requisite components to skilfull storytelling”. “I suppose half of the screenplay’s I’ve written have actually seen production. And I am being dead honest when I tell you this; I have absolutely no more idea as to why some of them happened than why some of them didn’t. “Yes, nifty dialogue helps one hell of a lot; sure, it’s nice if you can bring you characters to life. But you can have terrific characters spouting just swell talk to each other and if the structure is unsound, forget it.” I will be referring to his line many times in the future. Feels to me like one of those verses from sacred books: you could spend years trying to grasp its full meaning. “I haven seen a lot, learned more than a little -most of it, alas, too late”. That’s William Goldman. Enjoy him discussing his work in William Goldman Speaks. This entry was posted in BOOKS on filmmaking, BOOKS on screenwriting, FILMMAKING, SCREENWRITING and tagged Adventures in the Screen Trade, All The Presiden'ts Men, Butch Cassidy and the Sundance Kid, Marathon Man, Nobody Knows Anything, Papillon, Screenplays are Structure, The Princess Bride, The Thing Of It Is..., William Goldman. Bookmark the permalink.